Eikichi Yazawa (born September 14, 1949 in Hiroshima) is an influential Japanese singer-songwriter, and important figure in Japanese popular music. 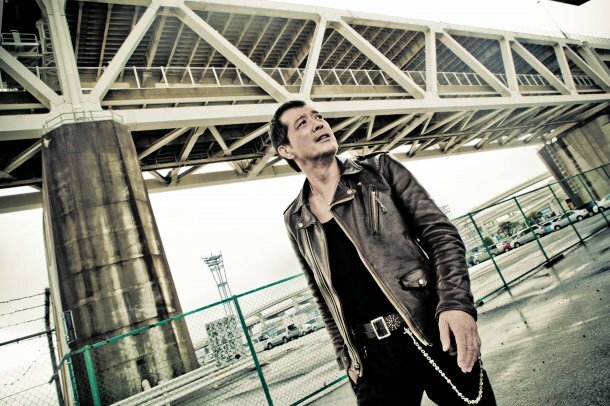 Eikichi Yazawa does not have a classification; he does not belong to any stereotypical genre in Japan and does not seem to be restricted by any traditional barriers which might alter his music style. The combination of his music, appearance, attitude, and overall original style stifles would-be copycats of this world-renown rocker. Yazawa formed the band Carol in 1972, a rockabilly group which became a legend in Japanese music. After the band broke up in 1975, Yazawa flew to the U.S. to start his solo career. His first solo album, I Love You, OK, was recorded at the A&M studio in Los Angeles and produced by Tom Mack. In 1977, he was the Japanese first solo rock artist to perform at the Budokan hall in Tokyo, to a full crowd of over 13,000 people. He now holds the record of most performances at the Budokan hall, having performed there over 100 times (the hundredth being on December 16, 2007). 1978 was a greatly successful year for Yazawa. His fourth studio album, Gold Rush, went to #1 in the charts. He also held a hugely successful performance at the Korakuen baseball stadium (now the Tokyo Dome) for over 40,000 people. In 1980, Yazawa signed a contract with the Warner Pioneer(present Warner Music Japan) record company and moved to the West Coast of the United States. He recorded the albums Yazawa (featuring members of American rock bands Little Feat and The Doobie Brothers), It’s Just Rock n’ Roll(also featuring members of The Doobie Brothers and several songs written by John McFee and Bobby LaKind), and Flash in Japan, all of which were released worldwide, but were not very commercially successful compared to his Japanese releases. In 1996 Yazawa appeared in a string of commercials for such products as “Boss” coffee. His commercials typically were of him in various “cool” poses around Tokyo, or in a comedically unfortunate situation (such as a salaryman running while eating or a accidentally toppling a group of bicycles), with his new songs serving as background music and his own voiceovers rather than on-camera talking. In the late 1990s, Yazawa was swindled out of about 3.5 billion yen for a huge building construction project in Australia. In December 2005, Yazawa ran a sold-out Japan tour of “live houses” (Japanese-English for a live-music club) as a part of his “back to roots” approach to his 30th anniversary as a solo artist, following the break up of rock band Carol in 1975. ‘Ei-chan’ delighted fans with a rendition of “Whiskey Coke,” a hit from that year (and a Karaoke library mainstay), as well as numbers from his 2005 album, “Only One,”. In 2007, Ichiro Suzuki(Seattle Mariners), a major-leagues player, chose his “Tomaranai Ha~Ha” as a AT-BAT MUSIC of 2008 with Ringo Shiina’s “Yokushitsu” and “Identity”. His albums have sold over 12 million copies in the Japanese market, and he has had a strong influence on modern Japanese rock music. He was invited to perform at Wembley Stadium alongside Robert Palmer, Bon Jovi, and Rod Stewart, and often performs live aid concerts. Seven of his albums were produced by Andrew Gold.